We are located in the lovely village of East Haddon, but within easy access of the M1, M6 and A14. 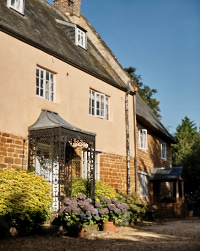 We are very close to Holdenby House and Althorp House and about a 30 minute drive from Silverstone. Our guest accommodation consists of a large double room with kingsized bed and a small twin room nextdoor, ideal for families or larger parties. There is a private bathroom. There is also a great pub about 3 minutes walk away!